Now Z-folded for faster packing. Celox Haemostatic Gauze is the treatment for life-threatening bleeding. It uses the proven Celox granules laminated on to a dense gauze, so it is quickly and easily packed into bleeding wounds. The gauze is especially useful in challenging conditions, in wind, rain or poor visibility. In the recent comparative study sponsored by the US military, Celox Gauze had the least overall blood loss, the highest survival and the highest overall haemostasis of all products. 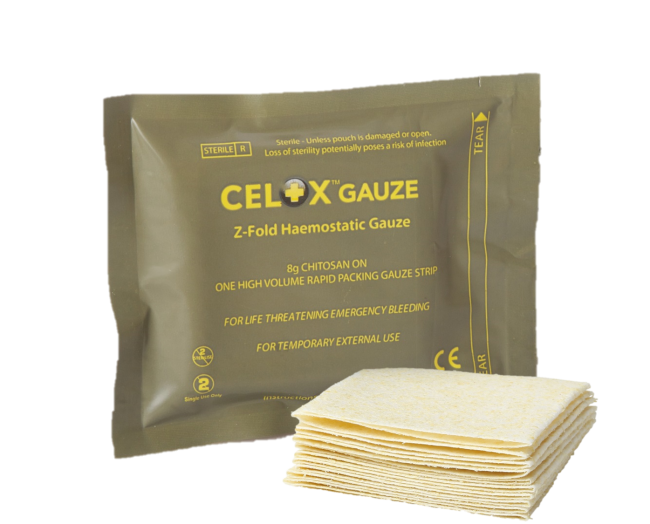 Celox Gauze is also available z-folded in a compact pack for ease of packing in IFAK and quick packing into wounds. Celox Gauze is a high density gauze, impregnated with the proven Celox granules, individually sterile packed in a ruggedized pouch with tear notches for fast opening. It is available in a 1.5 m, z-folded pack for a compact product for individual first aid kits and 3 m roll, ideal for the medic or vehicle kit.